Apps Aim To Guide You On 'Sustainable Food' (Whatever That Means) : The Salt Consumers who care about how their food is produced have a growing number of apps they can turn to at the supermarket. The problem? Nailing down just what sustainability means when it comes to food. Confused about all the different sustainability ratings out there? 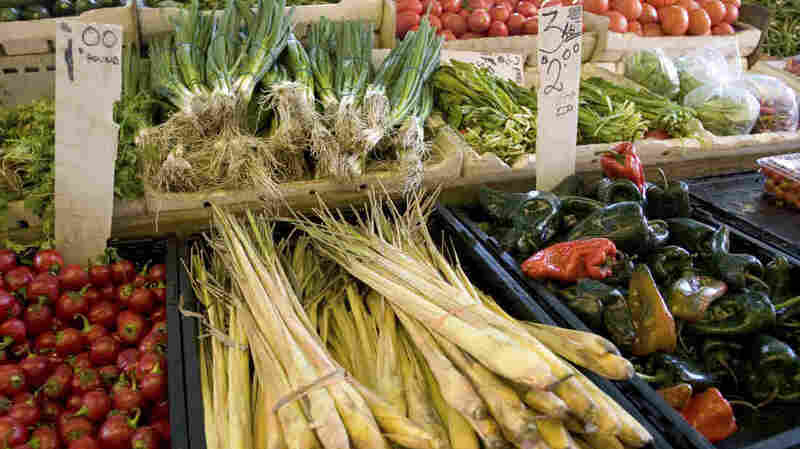 The simplest option may be to shop at your local farmer's market. This week, the Environmental Working Group rolled out a food ratings database and app, which, while focused on nutrition, also rate products on issues like organic certification, animal welfare standards and environmental contaminants. Others in this space include HowGood, an app that rates food products on 60 indicators of sustainability, and Good Guide, a tool that rates food and other products on safety, health and ethics. These all work a little differently. Some use ratings based on numerical scales; others use labels like "good" versus "great." But they all must sort through reams of data to get to those ratings. And this is where the biggest challenge lies — not in the technical realm, but in the semantics: How do you define sustainability? Which data do you choose? Sustainability is encompassed by so many data points that it's become a big data project. "The difficulty is you can never define it," says Chuck Benbrook, leader of the Center for Sustaining Agriculture and Natural Resources at Washington State University. That's because our understanding changes as we learn more about the issues that affect food production. Sustainability, he says, is "a journey, not a destination." The word "sustainability" also means different things to different companies, depending in part on what customer think is most important. Each of these rating systems includes a mix of natural resource conservation, the health of the farm ecology, labor, public health, nutrition and safety. But not every ratings system includes everything from each of these dimensions. For example, take HowGood, an app that rates more than 100,000 food products based on what the food is and its brand's sustainability. HowGood grabs information from groups including Fair Trade USA, the U.S. Department of Agriculture and the Food and Drug Administration, monitoring business practices, legal cases and the food system where the products come from. The 60 indicators HowGood looks at include a company's behavior, the origins of ingredients, and the manufacturing process. HowGood's team of data analysts then crunches the data in an algorithm so people can fire up the app to find out if the milk they want to buy is Good, Very Good, or Great. "We are essentially a big data aggregator," says Alexander Gillett, CEO of HowGood. "What we're doing is we're gathering all the available information that's out there." Meanwhile, the new Environmental Working Group database rates foods on a scale of 1 to 10, with 1 being the best product, based on nutrition, ingredients and how processed a food item is. Good Guide also scores products on a scale of 1 to 10 — but with 10 being the best. Good Guide looks at the product's ingredients, its environmental impact and the company's attention to labor rights and helping its community. Of course, grocers are getting into the sustainability ratings game, too. Earlier this month, Whole Foods Market began implementing a new sustainability ratings program for its fruits, vegetables and flowers. The program, which affixes "Responsibly Grown" labels to products that pass muster, evaluates factors such as how well the farmers are treated, whether pesticides are used, how land and water are conserved and whether waste is properly disposed of. Another potential pitfall: The standards used to assess the sustainability of a big company that produces a given food product, like Coca-Cola or Kraft, can sometimes be too simple, says Molly Anderson, professor of food and sustainable agriculture systems at the College of the Atlantic. Ratings systems may merely look at whether these companies have a vice president of sustainability or a mechanism for laborers to raise a grievance, she says, but those criteria don't say much about how the company actually acts. Oh, and there's one other major hurdle that sustainability ratings apps face: getting consumers to care. Fair Trade USA says according to a study it conducted in 2013, only 16 percent of U.S. households claimed they purchased fair trade products in the past three months. "I don't think most of these [sustainability] apps are commercially viable," says Bill Pease, chief scientist at GoodGuide. "We give ours away for free. We do it essentially as a public service." But the fact that there's so many apps and standards out there, he says, may leave consumers feeling overwhelmed, and more likely to just give up. There are groups working to make it simpler by creating a universal sustainability standard – one as easy to understand as seeing a USDA-certified organic sticker on an apple. "One possibility is the government will recognize that [it needs] to be setting those standards," says Anderson. "The other possibility is that the industry will consolidate around standards that they feel work for them and basically impose them on producers." On that front, there are panels of experts working on creating across-the-board sustainability standards for companies to follow, like Leonardo Academy's National Sustainable Agriculture Standard, published last November. But even if you can get academics and industry to agree on a definition of sustainability, the process is pricey: Anderson guesses it will take a million dollars just to develop and publicize it. In the meantime, what's a consumer to do? For now, the simplest answer may be the best, says Anderson: You don't need an app or a rating if you buy local. "Know your farmer, know your producer." Alison Bruzek is an intern for NPR's science desk.